Looking To Purchase Custom Knee Braces? Over the last decade there have been many improvements in custom knee braces. Braces used to be bulky, ineffective, and ugly contraptions that would continuously slide down and they came in one colour, black. Thankfully that is no longer the case. While braces may not win fashion forward awards for design they have improved in many ways. Lighter materials, stronger and more durable, more effective in offloading and protecting your knee. They are significantly slimmer and may be worn under trousers and come in a variety of colours. Our team of registered physiotherapists is knowledgeable and trained in dispensing custom knee braces. They are well versed in handling the injury and recovery process and sorting through the many varieties of custom knee brace options. We understand how knees function, how knee problems can be solved according to your work and play, and are highly trained to identify the conditions that require immediate treatment. Focus Physiotherapy locations are equipped to provide custom knee braces for all levels of activity and sport. Our Registered Physiotherapists can identify the correct knee brace for your particular situation. Focus Physiotherapy provides knee braces for postoperative recovery, ligament strains or ruptures, knee instability and osteoarthritis. Our Custom Knee Braces are designed with the purpose of improving your functional and sport capacity. Given the repeated wear and tear we put our knees through, custom made knee braces can result in quicker injury recovery and faster post operative rehabilitation. Many people have found bracing has returned them to a level of function and activity they thought lost. Custom knee braces are recommended to both stabilize and protect the knee joint from injury. These devices, made of various lightweight composite materials are very supportive to the knee during daily activities. The custom knee braces are based on precise measurements of your leg. Based on innovative technology and are specifically designed for extra comfort and fit. This devices have of air mesh vents and the frame pads for a better airflow. The vents allow the cool air to enter in to keep the skin dry, reduce pinching and the pads help alleviate pressure points too. Our custom measurements ensure a perfect fit, however, in case of any issues and questions regarding how and when to use the knee braces, we gladly respond to your questions. Above is a video of one of the many types of braces we carry. Contact us today to book an appointment for a custom fitting. There are different categories of knee braces that are designed for utmost comfort, support, stability and safety. The Patellofemora knee brace, to keep the knee cap in its proper place and to hold the patella. The knee cap is held firmly with a strap and allows the knee to move safely. The functional braces specifically used to treat the sports injuries, after surgery, in case of MCL (medial collateral ligament), LCL (lateral collateral ligament), ACL, PCL (anterior and posterior cruciate ligaments). 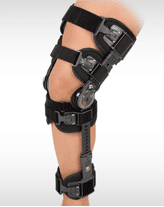 Unloader braces are used to treat rheumatoid arthritis, knee joint pain, stability. The hinges on the unloader brace serve to reduce friction and support joints. The selection of the brace will depend on the kind of knee injury, such as to treat ligament strains, osteoarthritis, meniscal damage, and general knee pain. It is important to choose the right type of knee braces. A brace used by runners for ligament strain is definitely different from a ligament strain brace used by a basketball player. The treatment time period, such as how much and for how long a person can wear braces will definitely depend on the injury and severity of pain.